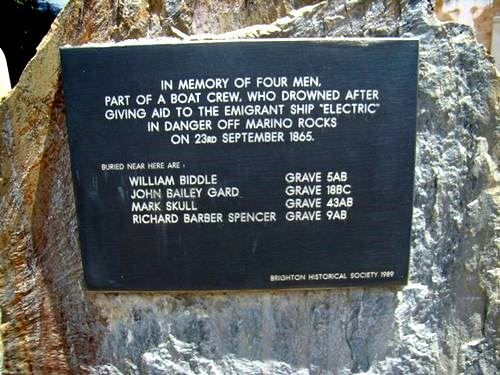 Memorial commemorates four men (William Biddle, John Gard, Mark Skull and Richard Spencer) who were part of a boat crew who drowned after giving aid to the emigrant ship "Electric" which was in danger off Marino Rocks in 1865. About 9 o'clock on Saturday morning Captain Duff, Harbor Master at Glenelg, having heard that a ship was aground near the rocks at Marino, telegraphed to the Port for a steamer to render immediate assistance, and then manned Mr. Flood's boat, in which he at once sailed to the distressed vessel, making the run of six miles, with a fair wind, in three quarters of an hour. His boat's crew consisted of Richard Barber, Mark Skull, William Biddle, John Gard, James Burton, and Thomas Shepherd (coxswain). The vessel, which proved to be the Electric from London, was lying in shallow water, and in dangerous proximity to the rocks half way between Marino and Field's River. At this time the sea was very high, and the position of the boat was becoming dangerous. The men, therefore, as soon as the steamer had the Electric fairly in tow, and was beginning to move with her, determined to seek their own safety by pulling at once for the jetty or the sandy beach, hoping at least to clear the rocks before getting ashore. They had made about half-a-mile from, the ship, when "a tremendous sea came rolling in towards them like a wall" (we quote the words of one of the survivors). It broke into the boat, and " was too much for her." All the men were thrown into the sea, and Shepherd, the coxswain, received a violent blow in the chest from the steer oar. Meanwhile some twenty or thirty persons were watching on the rocks, anxious but utterly powerless to render assistance. They had ropes with them, but none had skill or daring to use them to any purpose. At this time it happened that Mr. Phillips, brother-in-law of the Bishop of Adelaide, who had been riding on the beach with one of his nieces, joined the throng. He saw at once that lives might be saved by an act of daring which very few men would have ventured upon. Seizing a rope, and urging those on shore to hold it fast, he rode over the rocks, and, regardless of all remonstrance, dashed into the foaming surf. He first reached Burton, to whom he handed the rope, and turning his horse's head landward, succeeded by two desperate plunges in dragging him out of the water. The bold rider was instantly again among the waves. He threw the rope to Gard and Biddle, but they were unable to catch it and they were never seen again. Mr. Phillips, seeing that there was still another life to be saved, again, urged his horse seaward, and reached Shepherd, who was considerably further from the rocks, supported by the oars. In doing this the daring horseman very nearly lost his own life but the second survivor was rescued. Mr Phillips has saved two lives at the risk of his own ; and, in doing so, averted from two women the grief of widowhood, and ten children the calamity of orphanage. But it is sad to remember that, there are still four widows and still ten orphan children. South Australian Register (Adelaide), 25 September 1865. Giving Aid To The Emigrant Ship "Electric"